Describe CSMA/CD or describe the access method of Ether LANs. Every station has an equal right on the medium. Every station senses the medium before sending a frame and if the medium is idle only then the station sends the frame. It may happen, that two stations senses the medium at a time and find it idle and send frame. This time a collision will occur. That’s why the protocol forces the stations to sense the medium even after the sending has begun and the stations are able to sense the collision. After sensing the collision the stations send a jam signal which destroys the frames on the line and the stations wait for some random amount of time and re-send their frames avoiding the collision. The Minimum Frame Length: The time the station needs to wait to be sure that there is no data on the medium is the minimum frame length. The Data Transmission Rate: The time required to send out the minimum frame length. 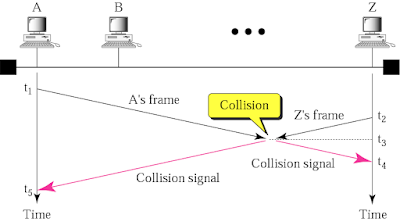 The Collision Domain: The maximum network distance.